Wine List: a decent selection of wines, but expensive. 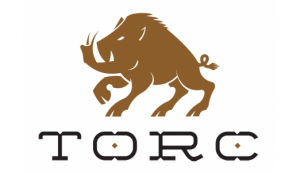 Unique: Torc is a modern, lively restaurant with high ceilings and a focus on locally grown ingredients. The chef Sean O’Toole translates the flavors of Napa into beautiful plates with a unique twist. Now I like beautiful food, but quantity is important too. It would be different if one was expecting amuse-bouche (single, bite-sized hors d’œuvres) or many additional courses, but the portions were itty-bitty! 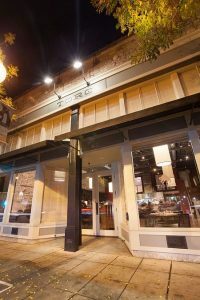 Located in downtown Napa, it is conveniently located within walking distance of our favorite tasting room and winery PureCru. Parking is convenient and always available in the ramp nearby. 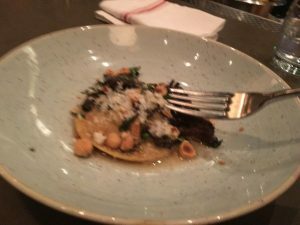 The restaurant was recommended by a local foodie and friend and four of us were able to be seated at the bar since we had no reservation. The hostess did a great job of getting other patrons to scooch down, in spite of their reluctance. The place had a number of empty tables set with white linens and the entire second floors appeared empty, but we were told that all of them were reserved. The bar was packed, but nice, with a number of servers and mixologists making creative cocktails in the $12-16 range. We ordered a variety of cappuccino, cocktails, and wine. The place had a very modern feel, but the music was a bit loud. Our server was fine, but not memorable. In fact, the check only named him as Bar B! The problem we had was that we left starving! Very little food for a whole lot of money! 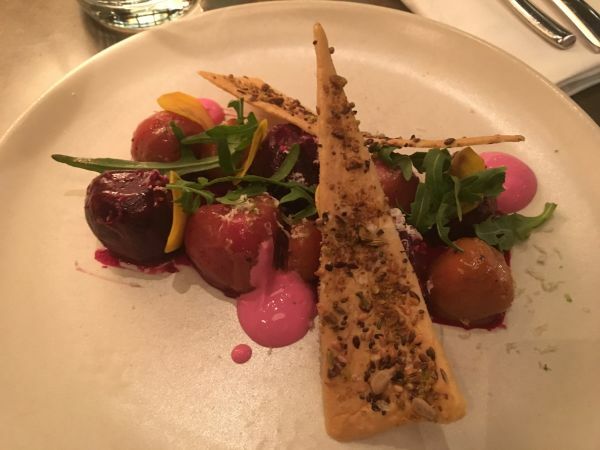 Their menu items are artistic and pleasing to the eye. 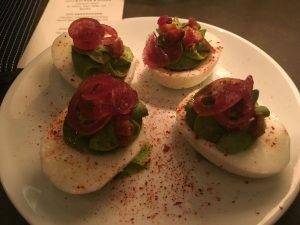 They offer unusual and unique dishes including avocado deviled eggs, English pea risotto (garnished with edible flowers topping the green risotto, it’s a dish that almost looks like a garden). Everything we ate tasted good and perhaps we should have ordered “heavier items”, which might have included Akaushi beef short rib or heritage porchetta. farm fresh, pickled onions, bacon. These were tiny! Our friend ordered them as his appetizer. Wild arugula, tzatziki, horseradish, everything cracker. Thank goodness my husband and I each ordered our own salad because these were very flavorful and delicious, notwithstanding it’s small size. Unfortunately, I didn’t snap a photo of our friends’ grits. The portion was literally less than a cup. I realize that the truffles (Tartufo Bianco di Alba) are regarded as the finest in Italy/Europ, but holy smokes! Creamy brandade, yukon potato, lemon-caper brown butter. His was probably the best entree between us. 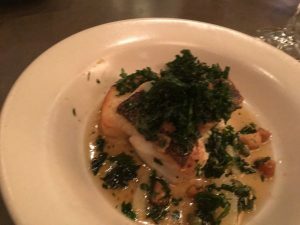 The cod was cooked perfectly. It was flaky and delicious and though “Brandade” is an emulsion of salt cod and olive oil typically eaten in winter with bread or potatoes, but there were almost no potatoes, nor any bread to be found! Citrus lacquer, brussels sprouts, black radish, young ginger. 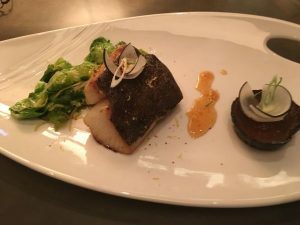 The white flesh of the sablefish is usually soft-textured and mildly flavored. When cooked, its flaky texture is similar to Chilean sea bass. It was ok, but I’ve had better. If you look at the presentation, there were literally maybe two brussels sprouts that had been separated from its core and the fish portion was VERY small. Dessert: We skipped it and wanted to leave. 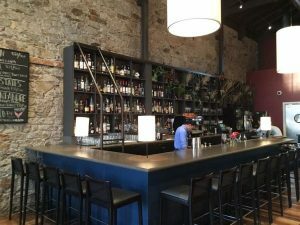 The wine list was impressive if you’re looking for some higher end bottles, and the wine list by the glass is spendy with not as many options as would be expected in wine country. Our friend left hungry stating he has “Eaten there twice, (his) first and (his) last!” My husband ate a bag of popcorn as soon as we got back to the house because he was still hungry!